Sean, they're excellent! Thanks for putting those up on the site. 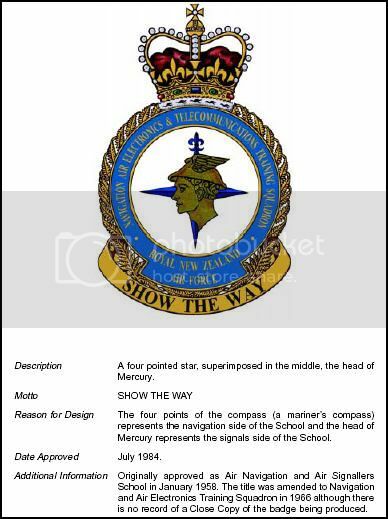 It's good to see how those crests came about, and what they mean. I always wondered why Wigram Base's crest had a scallop on it! 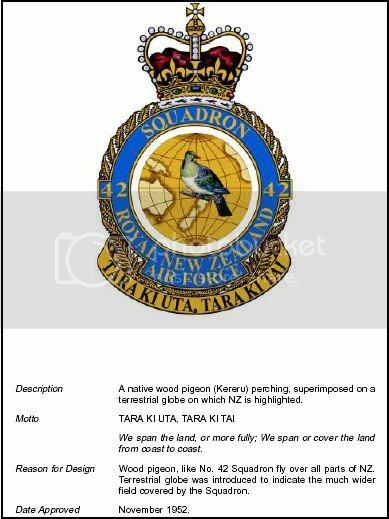 Excellent to read that someone managed to confuse a Kea for a Kaka on the 14 SQN crest! 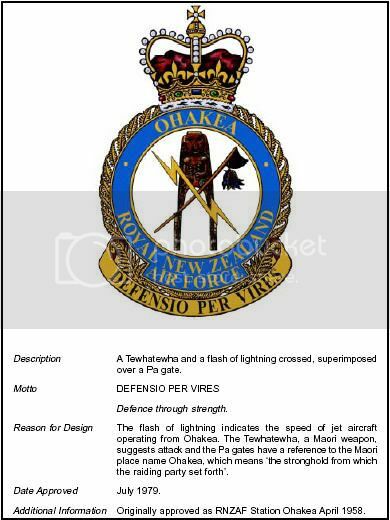 Heraldic descriptions always confuse me though - I was just researching the Auckland Provincial coat of Arms to go on the fin of my DC-6 Model, and that took a bit of decoding - "Supported by Apterix rampant" (Held up by Kiwis...) Sinister, Dexter, proper, and they say that aviation has bizarre language! 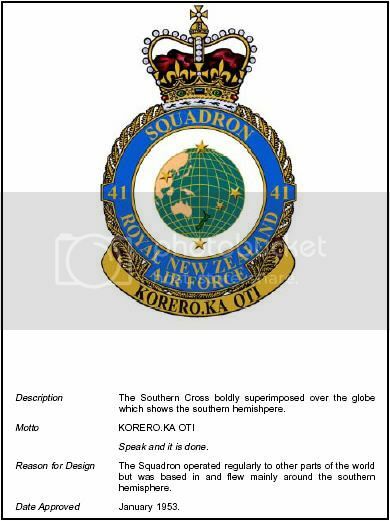 Excellent collection of crests though, thanks heaps for posting them. 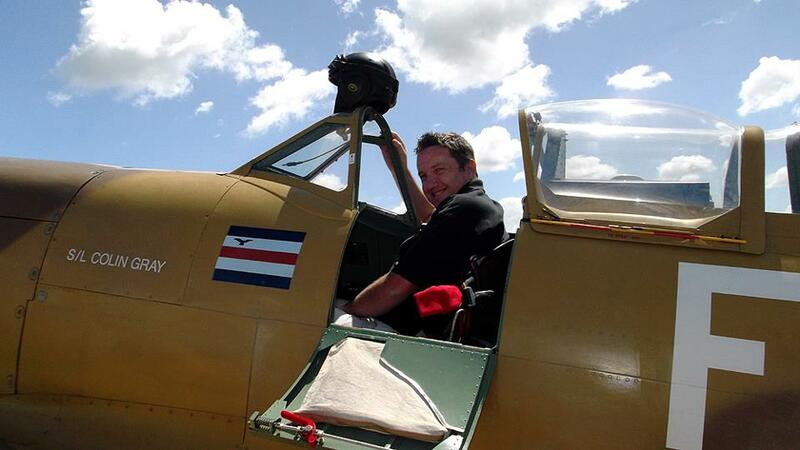 Thanks Sean, those are absolutely fantastic mate. Many of them i had never seen though a good deal of them are familiar, but seeing them day to day around base I never really stopped to study the detail. So, as Craig says, it's great to get the explanations. I wonder if some of the squadrons didn't get crests, or if the book only covers the postwar squadrons - but then six of the 7 RAF sqns shouldn't be covered. woah, thanks alot for putting those up i've visited 40 sqn but they didn't share anything about their crests or its meaning. did that take a long time to put together? 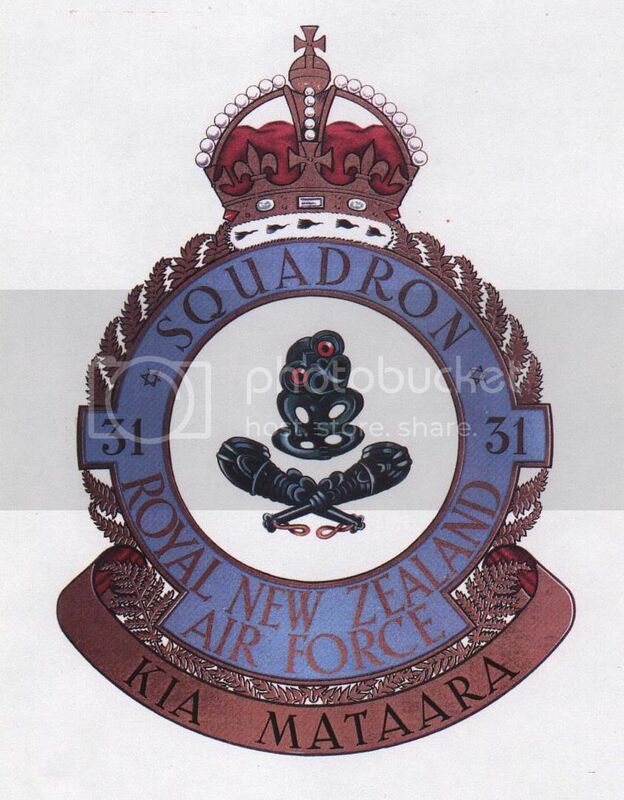 I just worked out that all these are post 1952, and thus have the Queen Elizabeth crown atop them. So earlier crests would have looked a little different and carried King George VI's crown on the same design. 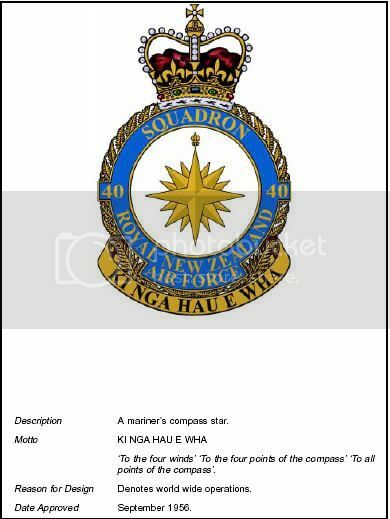 That explains why the other wartime squadrons are not seen, as these are all the squadrons and units that have served post coronation. 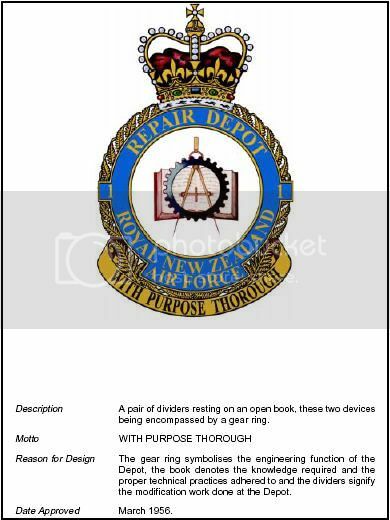 I wonder if there's a pre-1952 version of this book anywhere. 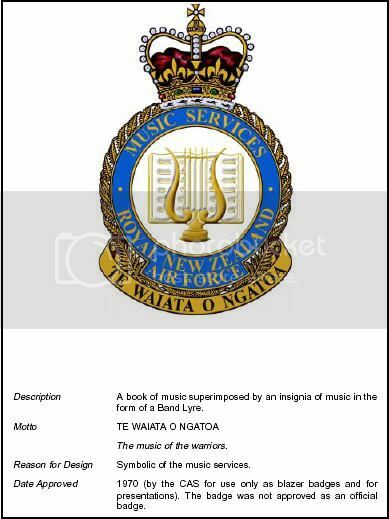 I spoke to the author of the NZAP 3327 Colours. Standards, Flags and Badges in the RNZAF, and he said, that only official crests are listed in the manual. Any other RNZAF crests that exist are not considered "official", as they have not been approved, or verified authentic etc by the RNZAF, or the UK Heraldic type people. The crests listed in the NZAP 3327 have meet the requirements, and are thus listed. 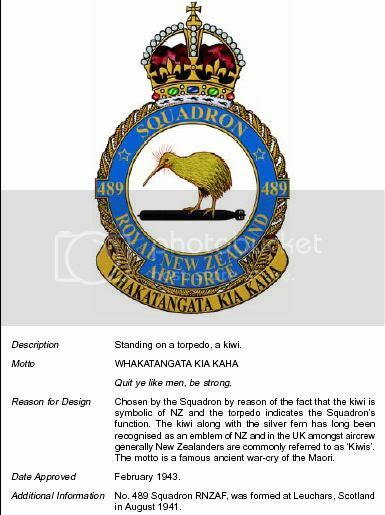 I know this might provoke some "feed back" (especially with 30 SQN RNZAF people, but I guess if they have some kind of proof of approval etc, then it is time to get it acknowledged officially. As stated, these two crests are not considered official. Thanks Sean. That is interesting indeed. 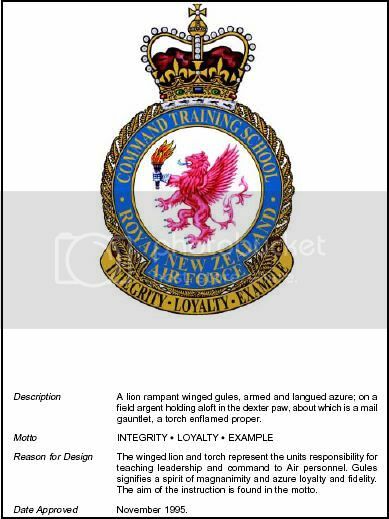 I wonder why the squadrons never got their crests certified. 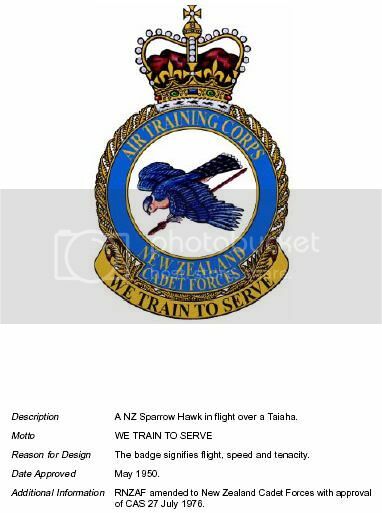 I guess many other wartime crests will be in the same boat. 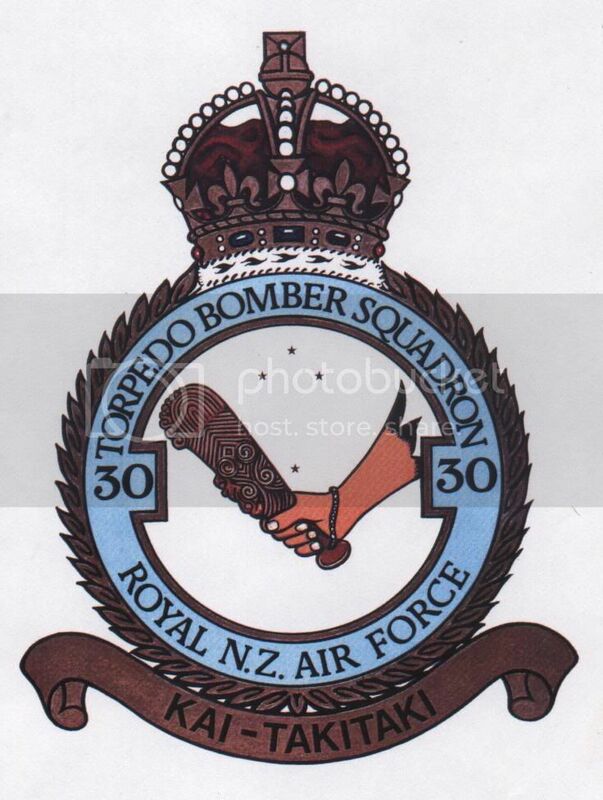 This would seem to indicate that it is not official, as there should only be one version of the 30 Sqn crest. 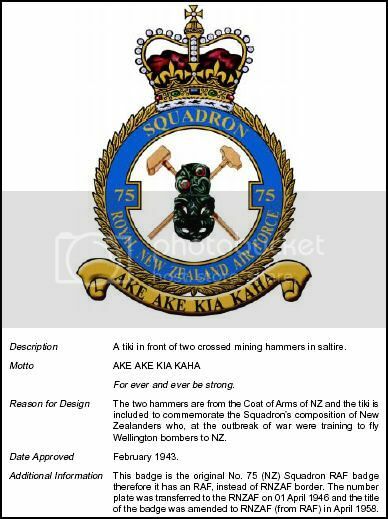 The author of the NZAP did mention that during WWII, some squadrons just made their own crests and did not get them approved, or did not seek approval because there were more important things to do, other than apply for design approval of crests..
Makes sense as they were not applied to aircraft or anything in an official capacity, and were probably more for hanging in the Mess than anything at that time. 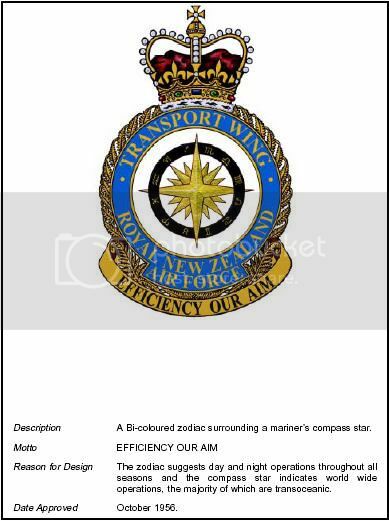 I got the scan out of this, which I picked up the other day. 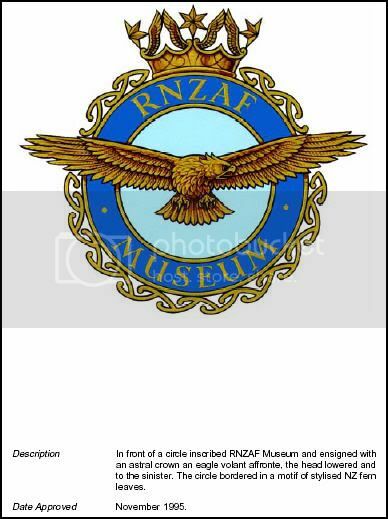 It is dated 1938, so this crest would probably be one of the first ever issued to the RNZAF. Yes, I got that programme recently too and took note of the crest. 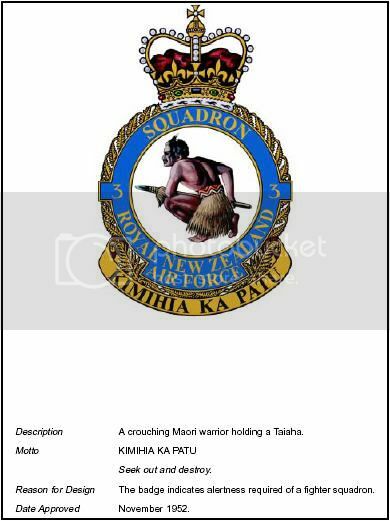 Great programme, and great crest. 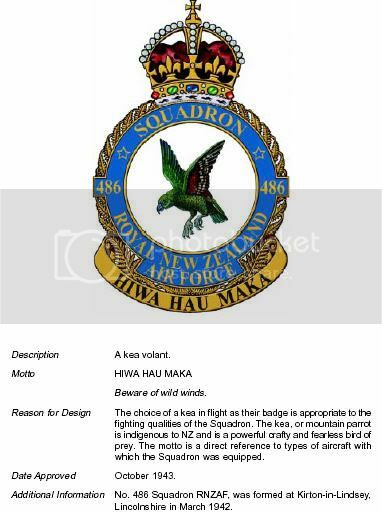 It's not a Kea, it's a bush hawk, or Karewa Rewa-Tara (or Falco novaeseelandiae), according to the write-up under the crest. 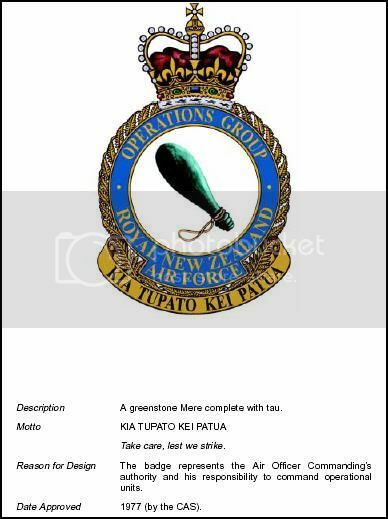 The motto 'TE ATETE-KIA TUPATO' means 'Let The Agressor Beware', a great motto. "This member of the falcon tribe is probably the most fearless of all our birds. 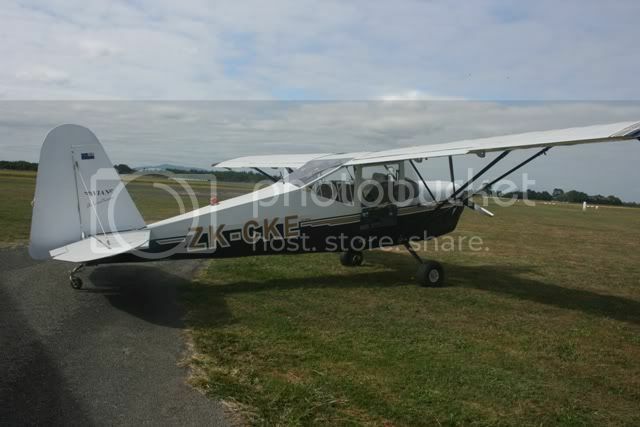 Regardless of its own danger, it will pursue its prey quite close to man and his habitations. A spirited and even rapacious hunter, it lives entirely by the chase... and had been known to kill pigeons, ducks and pukekos, and attack heron and shags. 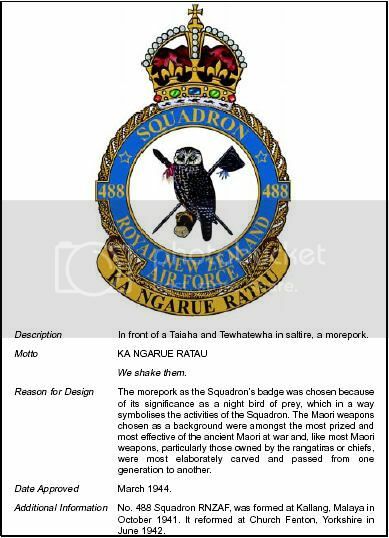 It is the vowed enemy of the harrier hawk and loses no opportunity of attacking it... Having sighted the prey, it drops like a miniature thunderbolt, grasps the victim by the alons of or both feet, and destroys life when it alights by crushing the head with its powerful beak." So there you go. 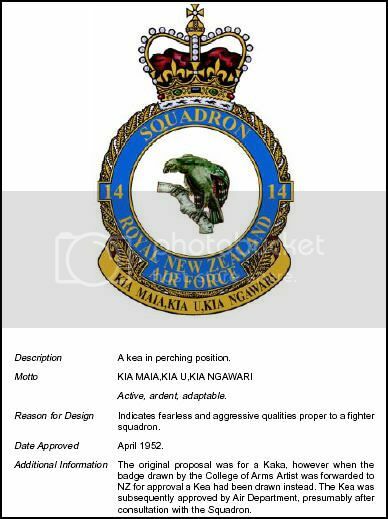 Much more deadly and probably a lot faster than the 2 Squadron Baffins! I asked Jane Provan at the museum about this crest, and she said she's unaware of any other prewar Territorial crests, and didn't even know about this one! Just found a suspect looking crest on Trademe, which says it is a 6 Sqn RNZAF crest, but it is very different from the official 6 Sqn RNZAF crest published in the NZAP 3327 Colours. 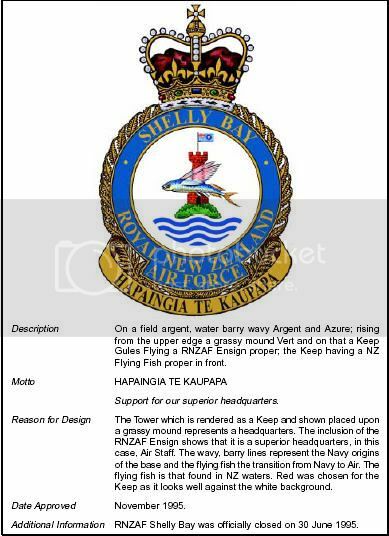 Standards, Flags and Badges in the RNZAF. 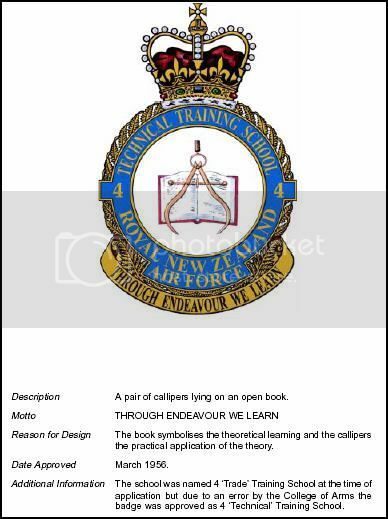 Has anyone seen this before, or know anything about it. 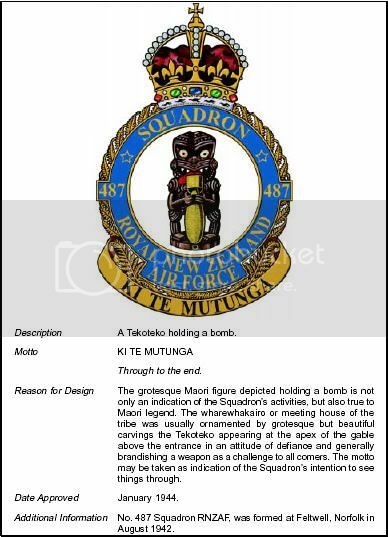 Tradmen says it came from the Eden Roskill RSA....... 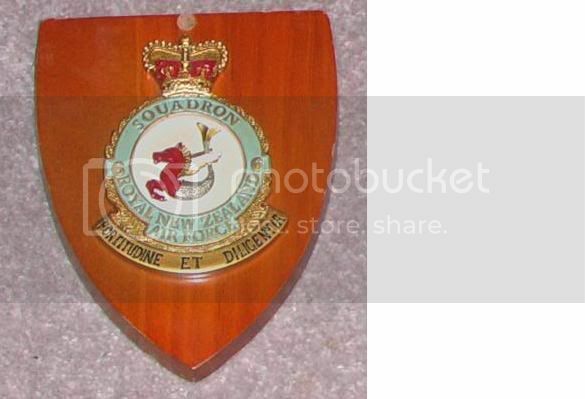 It even has the Queens Crown which means it was made after 1953. 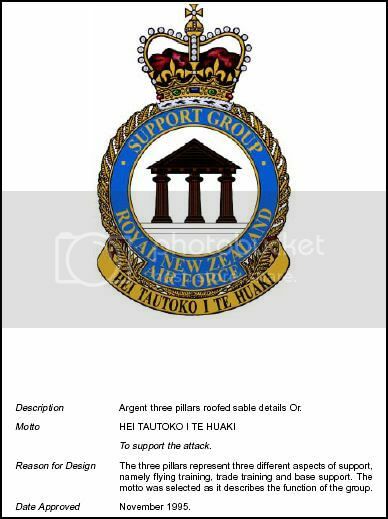 Appreciate any info tthat can be provided. 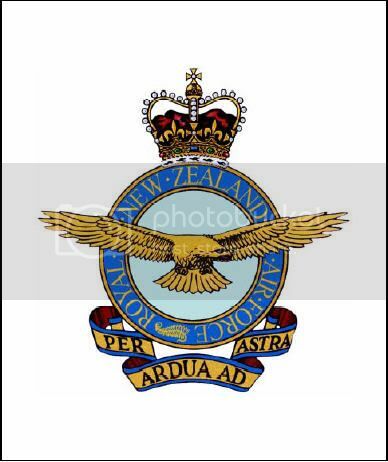 As far as I can tell, both 6 Sqn crests are correct. The "Vigilance with Patience" "Tane" Crest was approved postwar, but the "sea Horse" was the original wartime one, whether this was ever officially approved I dont know - perhaps someone with a knowlege of RNZAF Heraldry can clarify. There is a picture of the "sea horse" (what is it?) 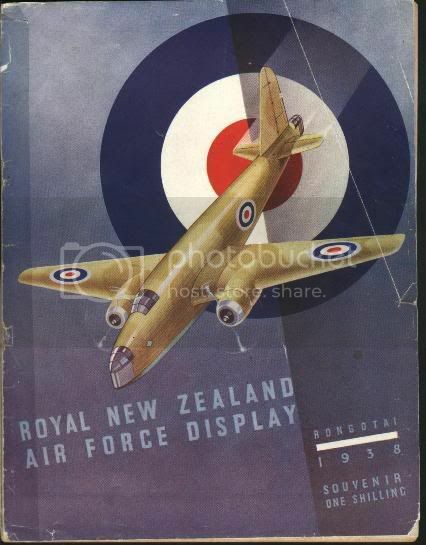 crest with the older style crown on Page 113 of "Golden age of NZ flying boats" but no clues as to its origin or official status. 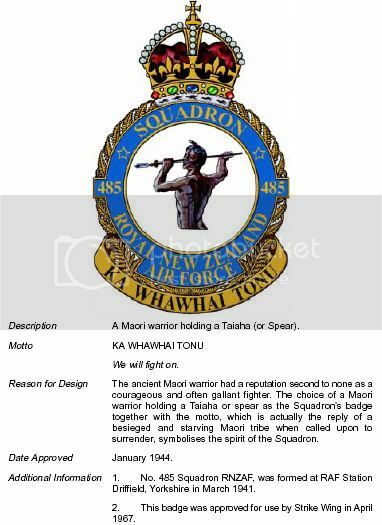 The current 6 Sqn page on the airforce web page (www.airforce.mil.nz) shows the "Tane" badge. Confused? Iam! No. 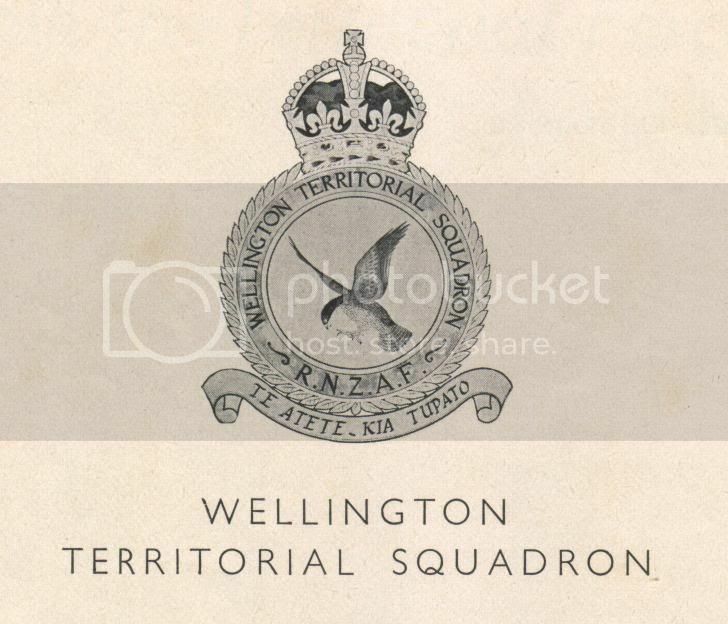 6 Squadron was a Territorial unit postwar, could this be when the crest changed? 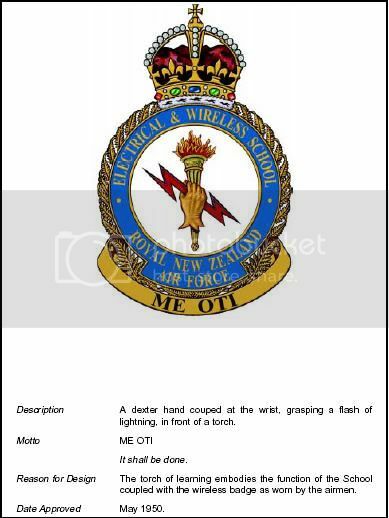 I sent off an email to CO 6 Sqn (LTCDR Keith Gilchrist) yesterday as well, and this is his response.
" 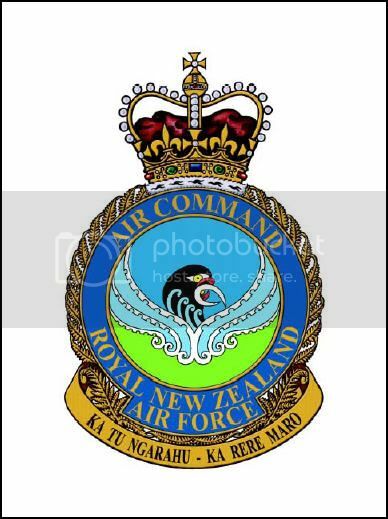 The approved crest is the one in the NZAP 3327. 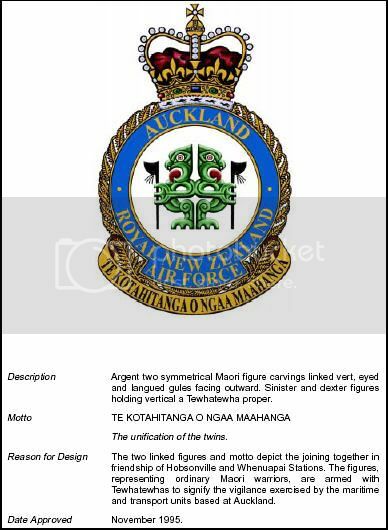 The one you found on Trademe is an unofficial crest that was proposed by the TAF Sqn in the early 50's, it didn't make it as far as the Heraldry Society for final approval. We have one presented by the Brevet Club last year, obviously there are a few kicking round". So if the unnapproved crest is from the 1950's the approved one must have come later I'd guess. So I wonder whether No. 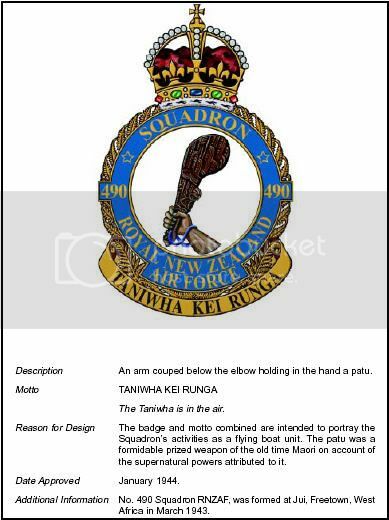 6 Squadron had a previous unapproved crest during the war too, when it was either an Army Co-operation Squadron or while it was a Flying Boat Squadron. Whoa wot a good thread this is thanks. 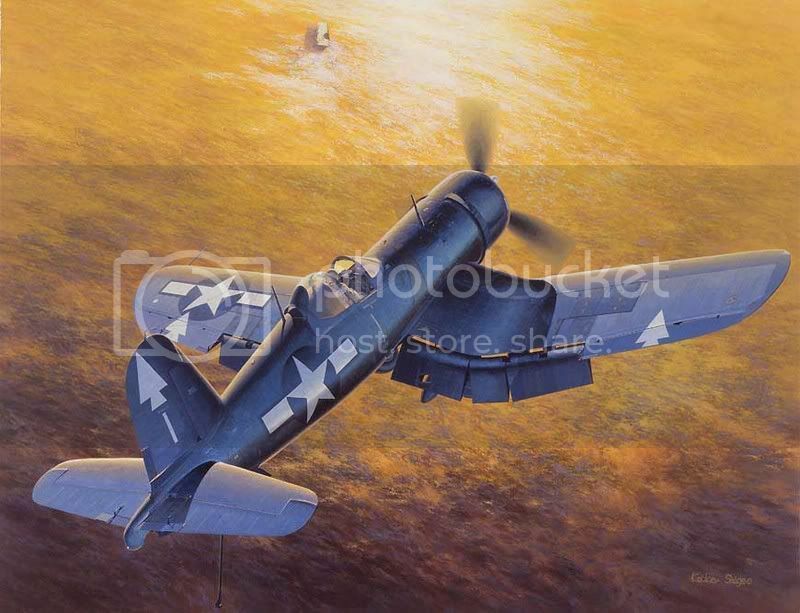 Any chance that Sean can lead us to the source to obtain higher quality images please? 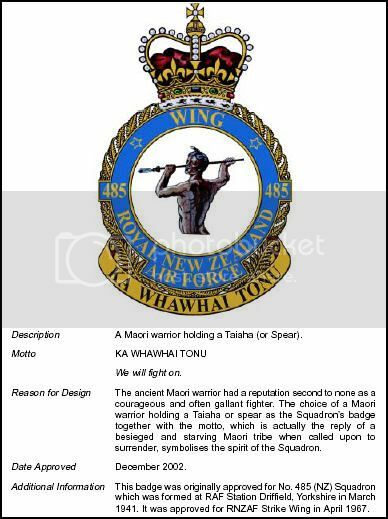 Tah.